This Dec. 21, 2017, file photo shows signs, including one featuring Papa John's founder John Schnatter, at a Papa John's pizza store in Quincy, Mass. Papa John's has reached a settlement agreement with founder John Schnatter that will see him step down from the pizza chain's board once an independent director that is mutually acceptable replaces him. If a new director isn't named prior to Papa John's 2019 annual shareholders meeting, Schnatter's term will expire at the meeting, according to a regulatory filing. The Louisville-based company will also remove a provision of a 'poison pill' rights plan adopted in July 2018 that restricted the ability of shareholders to communicate with each other. Papa John's will also drop a requirement that Starboard entities vote in favor of incumbent board members. In turn, Schnatter will withdraw his lawsuit against Papa John's. Last month Papa John's International Inc. tapped the CEO of activist investment firm Starboard Value to become its chairman. Starboard CEO Jeff Smith was the chairman of the board at Darden Restaurants, which owns the Olive Garden chain, from 2014-2016. 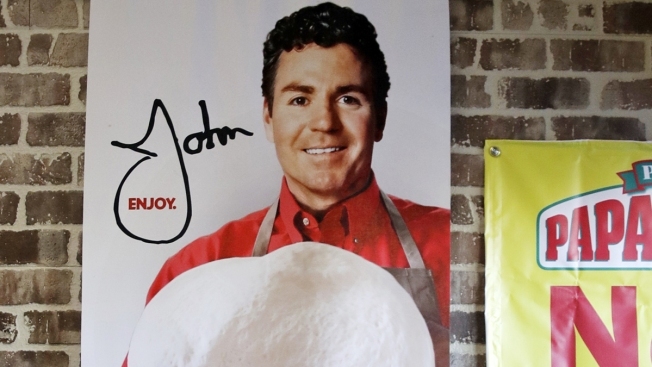 Papa John's brought Starboard on board in part to help engineer its turnaround efforts. Papa John's, which was founded in 1984, has been floundering after a series of missteps by Schnatter, who blamed disappointing sales on NFL player protests and used the N-word during a company conference call. Schnatter stepped down as CEO in late 2017 and resigned as chairman last July. Shares of Papa John's gained $1.19, or 2.8 percent, to $44.58 in Tuesday morning trading.